An electric kayak is a kayak outfitted with an electric motor (trolling motor) powered by a battery. Many people who own a Wavewalk kayak outfit it with an electric motor, or with an outboard gas motor. Wavewalk is the world leader in motorized kayaks in terms of stability, load capacity, seaworthiness, speed, versatility, mobility, comfort, and more. Not everyone can paddle their kayak over long distances, or in less than perfect conditions. Some kayakers suffer from disabilities, and others are elderly or not physically fit. Assisted paddling, namely paddling while an electric motor provides your kayak with additional propulsive power makes things easier, be it in strong wind, fast currents, or waves, as well as on flat water. When you motorize, you save your own energy, and you’re more comfortable. A human powered kayak is an under powered vessel, by definition. In a sustained mode, an average adult paddler can produce between one tenth of a horsepower and one quarter of a horsepower, and this is very little, even in comparison to weak electric motors. In case you’re too tired to paddle back to your starting point, or due to unfavorable changes in water or weather conditions, being able to propel your kayak with a motor can be a critical factor that could save your trip, and even your life – A motorized kayak is safer than a non-motorized one. Simply, having an extra source of power on board allows you to go further, since you can paddle to your destination, and motorize on the way back. So, whether you’re on a touring, fishing or on a photography trip, the motor allows you to cover more water, explore, and go to more places. You may want to take a passenger on board, or load your kayak with heavy camping gear, but this additional weight could make it too hard for you to paddle. In such case, a motor could make the difference. You can paddle your kayak and fish at the same time, namely engage in trolling, but an electric trolling motor or a small outboard gas motor can do a better job than your paddle. 6. Driving a motorized kayak is fun! Driving a motorized kayak can be fun too, especially if it’s a Wavewalk that’s outfitted with a powerful outboard motor. And driving standing, which is an option that all Wavewalk models offer, is even more fun – It’s comparable to skiing, except you’re going on water and not on snow, and it’s also comparable to water skiing, except for the fact that you’re free to go anywhere you want, including in choppy water and in waves, and you don’t depend on a powerboat to tow you. 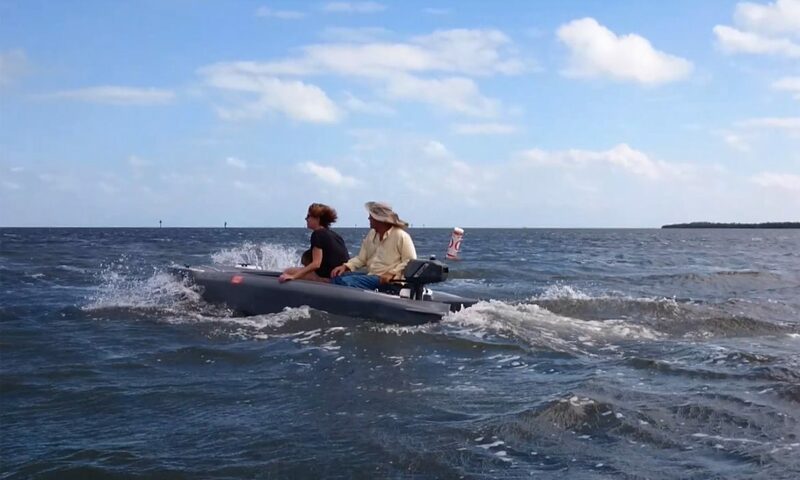 A Wavewalk outfitted with a mud motor (surface drive) can go where other boats can’t, and even where human powered kayaks can’t, such as mud flats, fast streams, etc. An S4 Wavewalk kayak outfitted with a powerful outboard motor can go at speeds approaching 20 mph, for as long as you want. This is more than five times the speed that a strong kayaker in a fast kayak (that is not a typical fishing kayak) can sustain for a limited amount of time, on flat water. In other words, a motor kayak can get you much faster to where you want to go, and back. Not everyone likes paddling, and not everyone thinks it’s cool. You may want to take someone on board your kayak, be it a child, your wife, an elderly parent, a fishing buddy, etc., and find that kayaking (or canoeing) doesn’t appeal to them, but going in a motorboat would, and to some of them the appeal would be greater if you go at high speed. Having a kayak powered by an outboard motor puts you in a unique position of being able to help other kayakers. You could do it by carrying heavy camping equipment on board your motorized kayak (realistically, only a Wavewalk…), taking passengers that aren’t fit for paddling, and by towing other kayaks. How Much Gear Can You Store Inside a Wavewalk Fishing Kayak? 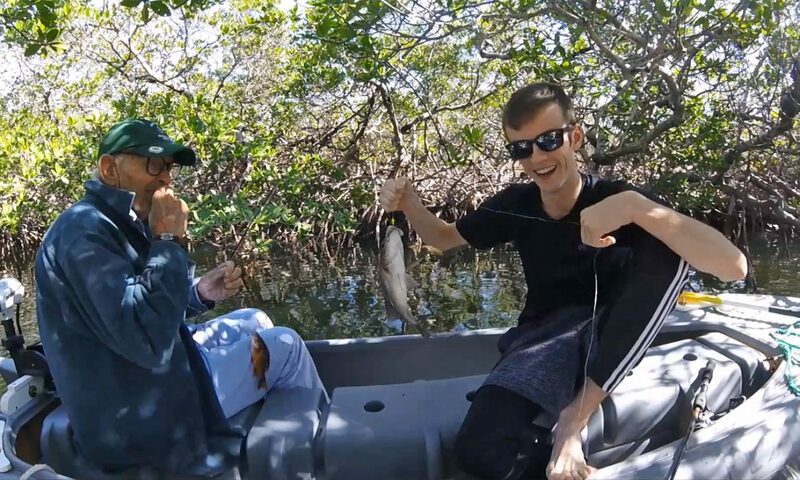 Bob and his grandson Austin had a great adventure yesterday. Austin caught a nice mangrove snapper. Well, the Northwest wind screamed through Key Largo dropping temperatures to the low 60’s. So, I put on my knit cap and wool insulated shirt and embarked upon putting a dive ladder on the bow of my electric W700. Five Oceans Company sells an under platform mounted stainless steel dive ladder that fits perfectly between the hulls of the Wavewalk W700. It is great when a plan comes together but I may not be able to test it till next summer. Our water temp has dropped to 74 degrees F.
This article examines the latest developments in motor kayaks, and what these developments mean for anglers. As kayaks became increasingly popular among anglers, some of them started ‘rigging’ (outfitting) their kayaks with electric trolling motors. The need for doing so arose from the fact that paddling alone was insufficient in many ways – Monohull (common) sit-in and SOT kayaks are excessively wide, heavy and sluggish to their very inefficient design [¹], and paddling them to longer distances in not a possibility that’s offered to most people, especially in adverse conditions such as wind and current. Typically, the motors used for this purpose were weak (30 lbs to 50 lbs thrust) trolling motors, powered by a 12 Volt lead-acid, deep-cycle marine battery. To this day, this is still a popular setup, and it stayed so thanks mainly to its low cost. In this sense, kayak fishing, which started as a human powered sport, joined other forms of fishing from small craft, namely canoes, dinghies, etc. The advent of Lithium-Ion (Li-On) batteries [²] with their more effective power to weight ratio has added to the appeal of the electric motorized fishing kayak, and as these batteries became more affordable, they contributed to the spreading of motorized kayaks as yet another fishing platform in the market for portable vessels. However, besides their high price, these new batteries still present a problem to the user, and it is the fact that the amount of energy they store is still no match for the energy stored in gasoline, which powers internal combustion engines, namely outboard gas motors, or simply “outboards”. As much as manufacturers of both kayaks and electric motors taut solutions based on the new Lithium-Ion batteries as the eco-friendly and quiet equivalent to motorboats, the fact of the matter is that they don’t compete well, at least when power and range of travel are concerned. Simply, the numbers are not there. 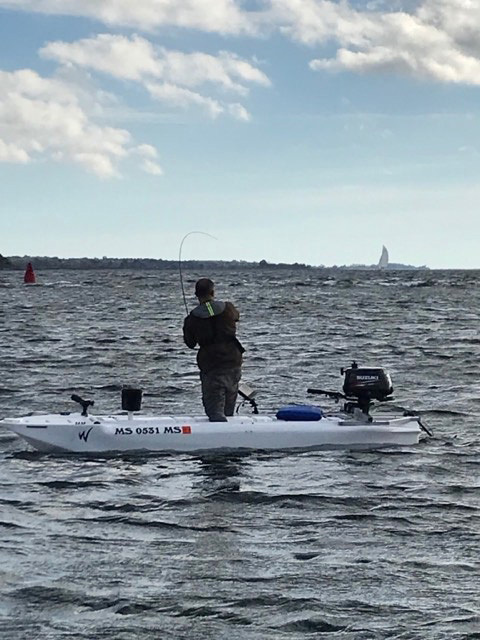 In recent years, a growing number of kayak manufacturers has been offering fishing kayaks designed especially to work in a motorized mode, with an integrated electric power drive. 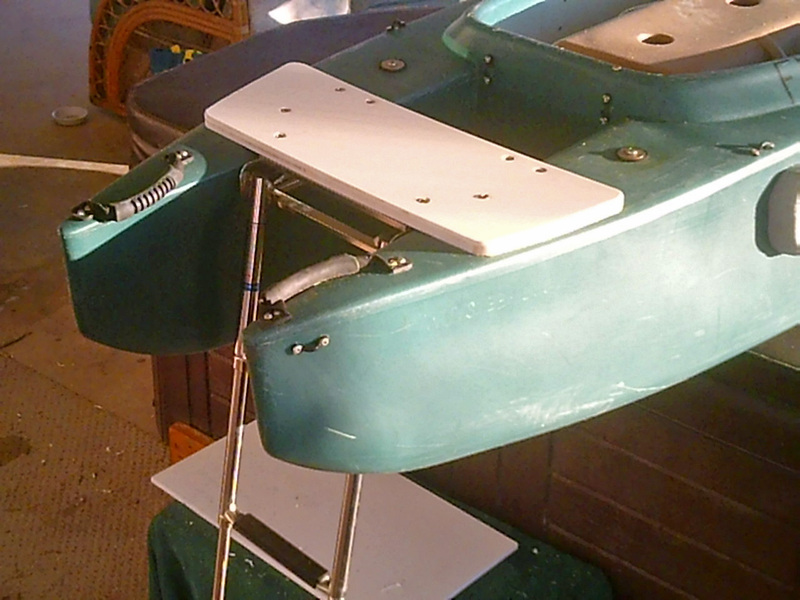 Typically, the electric motor is inserted in a special compartment in the middle of the kayak, under the area where the user sits, and the propeller rotates under the hull. This design is not effective in more than one way, starting from the fact that it exposes the propeller to unwanted encounters with vegetation that can make it stall, and hard underwater objects and structures that can damage it. This makes such motor kayaks rather useless in shallow water and/or in water where vegetation abounds. To say that this defeats the purpose of kayak fishing may not be an overstatement. 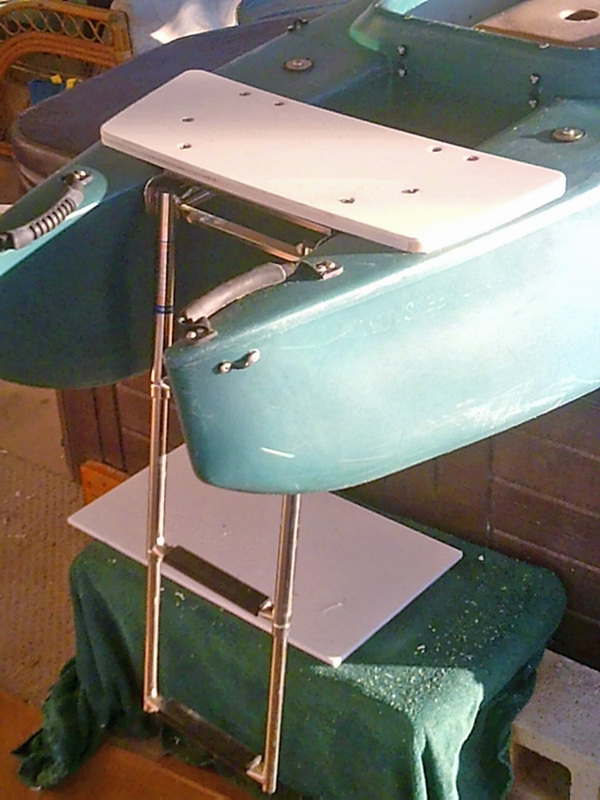 On top of this acute mobility problem, the location on the propeller under the kayak’s midsection makes it ineffective for steering, and forces the user to steer with a paddle and/or with a rudder system that adds unwanted complexity and clutter to a small vessel whose deck is already characterized by much clutter and too little workplace and comfort. No wonder these big ticket and rather lame motor kayaks haven’t become popular. Typically, common kayaks feature an elongated hull that’s pointy on both ends, and a cockpit that allows their user to sit in the middle of the deck. However, when small motors are concerned, having the user, namely the driver operate the motor from a close distance presents a major advantage in terms of safety, comfort, convenience and steering. For example, canoes, which feature hulls that are similar in shape to kayaks, are offered as paddling canoes with pointy front and rear ends, and square-end canoes where the transom is straight rather than pointy, and allows for mounting an outboard motor and for the driver to sit close to it. Having the driver of a motorized kayak sit in the middle of the boat and operate a motor that’s several feet behind them doesn’t work well, and in case of an outboard (gas motor), it doesn’t work at all, despite attempts from a few kayak manufacturers to create demo videos that would give the impression that it does…. 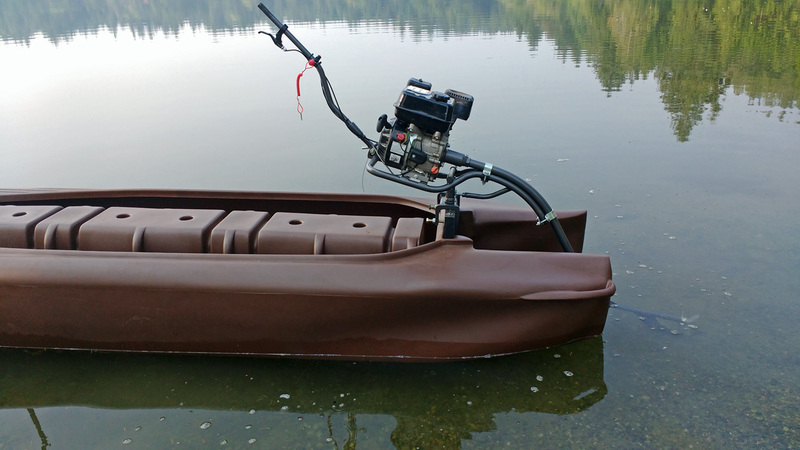 A couple of manufacturers of extra-wide hybrid fishing kayaks have tried to offer models designed especially for effective motorizing. The special thing about these models is that similarly to square end canoes, they feature a straight transom instead of a pointy rear end. 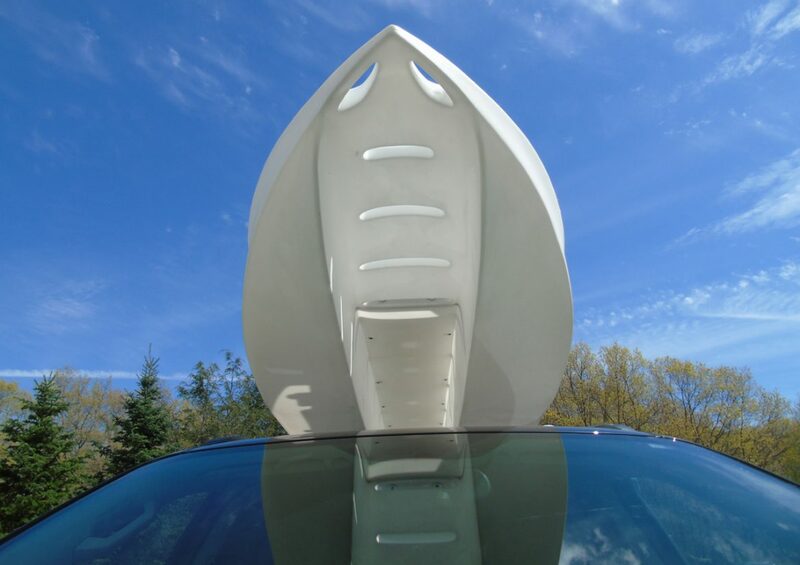 The width of the transom varies, and in the models that feature a very wide transom, it makes the kayak fall outside the designation of kayak, per US Coast Guard regulations. 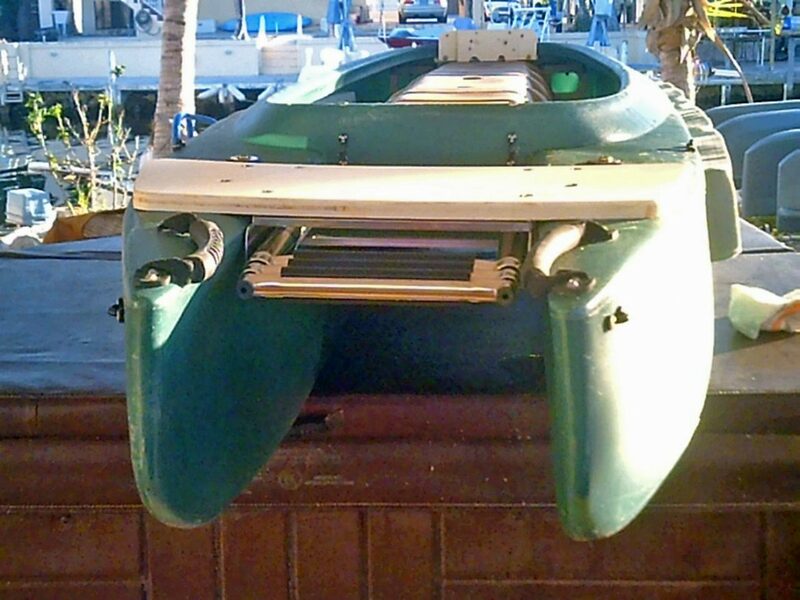 In any case, even hybrid kayaks (namely hybrid kayak / canoe) with an extremely wide transom don’t work as well as square end canoes, because unlike canoes, kayaks do not offer much in terms of free board, and as soon as the kayak’s rear is loaded with a motor and a driver, and it starts moving in the water with its front end pointing upward, its rear end sinks considerably and becomes too exposed to flooding for safe driving. And this happens even while driving on flat water, let alone in choppy water and waves. In their eternal quest to differentiate themselves from the competition and stay relevant, kayak manufacturers end up offering new designs and solutions that are highly similar to each other. 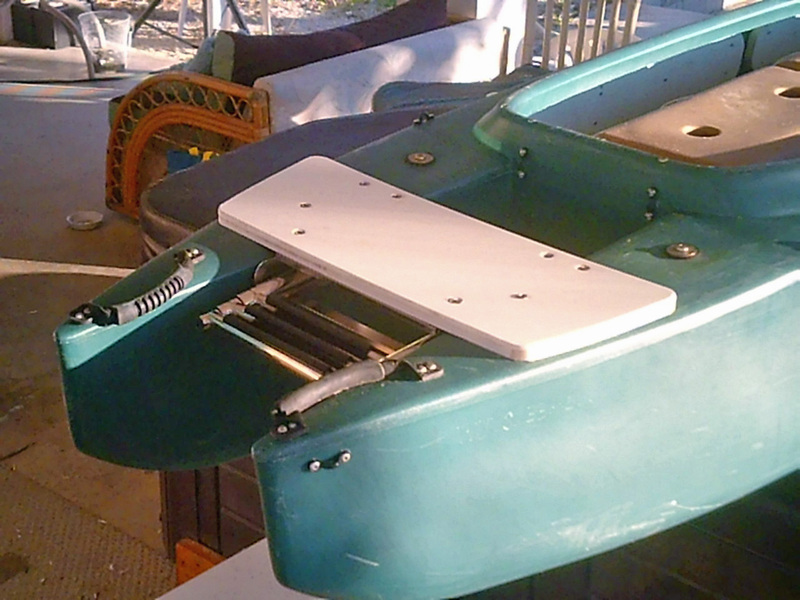 This happens not just in motorized kayaks, but in the market for pedal driven kayaks as well. And while pedal drives for kayaks are not within the scope of this article, it’s worthwhile to mention them since some vendors promote the fallacious notion that pedal kayaks could be an alternative to motorizing, although they certainly cannot, and they don’t even come close, at least when the real world and real people are concerned. To simplify the ergonomics that apply to pedal drives and to human power in general, an average adult kayaker who is neither old nor impaired can produce around 75 Watts, namely 0.1 Horsepower (HP) at a sustained mode, and only for a few hours. In comparison, the smallest outboard gas engine available today, which is the Honda 2.3, can deliver over twenty times more power, and 6 HP outboard motors that some Wavewalk S4 owners use can deliver up to sixty times more power… and all outboards can run as long as there is fuel in their tank. Are more words on this subject necessary? These specialty kayaks have been around for two decades, and they have not become popular although their performance in speed terms is impressive. The reason for this lack of market success is not just their price. It is the combination of the fact that they are still just SOT and sit-in kayaks, and this is not a good reference in terms of comfort and load capacity. Besides, jet drives don’t work that well in shallow water, where they can get clogged rather easily. In addition, unlike outboard motors that can be conveniently and inexpensively serviced by professionals at thousands of locations nationwide, proprietary jet drives are hard to fix, and fixing them requires support from the manufacturer, which is expensive and inconvenient. A heavy motorized board described by its manufacturer as a “kayak on steroids” and offered by them as a skiff for a solitary passenger is worth mentioning too, if only due to the fact that it relates to fishing kayaks, despite the fact that paddling it is harder than paddling most barge kayaks out there, namely the very big ones that are excessively wide and heavier than some dinghies. As this craft’s own owner’s manual states, it doesn’t work very well in choppy waters, and it shouldn’t be manned by more than one person. 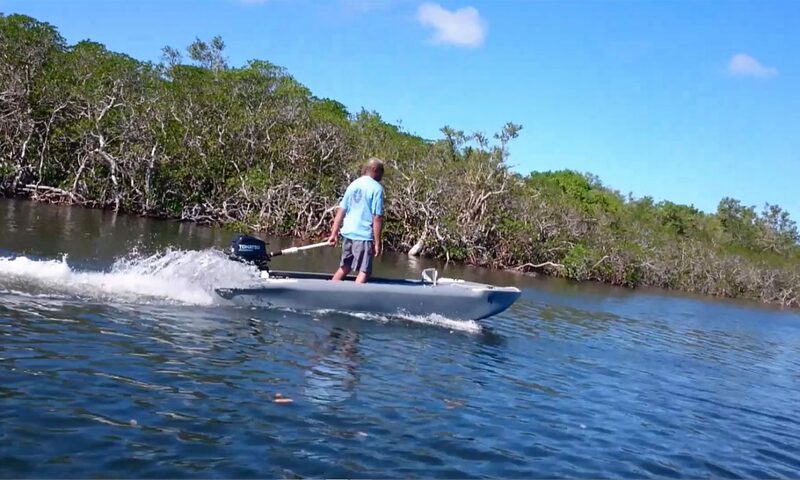 At 150 lbs without a motor, it is not a car-top boat, and it’s not a solution for anyone who doesn’t like to get wet while they engage in fishing or boating. What is the advantage of outboard gas motors? As previously mentioned in this article, an outboard gas engine is the only type of propulsion that delivers sufficient power to allow for a kayak to go fast in all kinds of water, to run all day, and to travel for long distances. In other words, it’s powerful and reliable, and therefore safer and more fun. 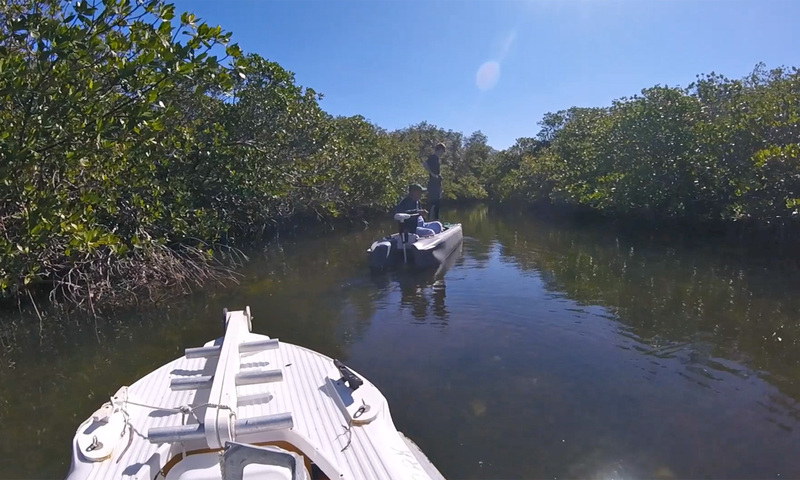 YouTube features some videos of SOT kayaks outfitted with outboard gas motors. Some of these kayaks are outfitted with an outrigger, because unlike in YouTube, in the real world, SOT kayaks, including big ones, are not stable enough to be driven with outboard motors. Either way, the result is rather pathetic, and makes the viewer wonder about whether our species really deserves to be called Homo Sapiens, namely wise man… The drivers of such kayaks are noticeably uncomfortable, and in most cases wet as well. Not a pretty sight. Practically speaking, Wavewalk kayaks are the only kayaks that offer full functionality and high performance when powered with outboard gas motors. This is why the company labeled its two bigger models skiff and portable boat. Indeed, they perform perfectly as such, and even better, be it in terms of stability, ease of use, comfort in driving, comfort to the passengers, dryness, load capacity, mobility, speed and seaworthiness. The Wavewalk is a patented invention, and it can be described as a compacted catamaran that features the saddle-seat of a personal watercraft (PWC) also known as jet-ski. This unique combination creates the most stable hull while offering the driver and passengers to balance themselves intuitively and effortlessly, in the most effective way possible. The result is a boat that punches way above its weight in terms of performance, to a point that it rivals much bigger boats. And indeed, some anglers and other fishers use their S4 instead of much bigger boats that they used to have before. 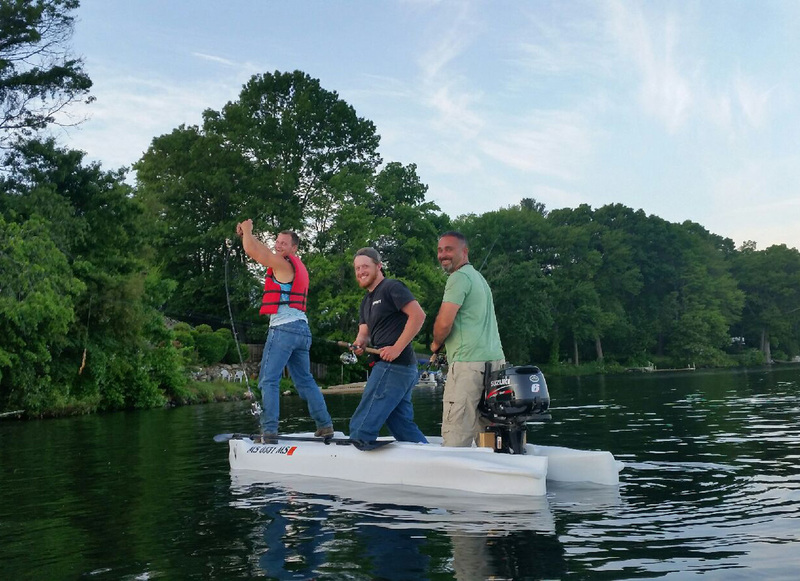 Motorizing options for Wavewalk kayaks are not limited to conventional outboard motors. In fact, it is possible to outfit the S4 with powerful surface-drive motors (a.k.a. mud motors), and by doing so, enhance their mobility and enable their users to go through very shallow water (“skinny water”), rocky streams, and water with abundant vegetation, such as lily pads, grass, and seaweeds. And let us not forget paddling, because the ability to propel a motor kayak with paddles as an alternative or complementary mode of propulsion is very important, to a point where it may be critical in certain situations, such as launching and beaching in tough spots, going in very shallow water where a boat could get stranded, especially at low tide, going through weeds, and in case something else prevents the motor from working.